Location: South side of the river Wye at Upperdale. There is no road access, just a steep track. Present state: Northbound platform extant. Southbound platform demolished. Notes: Monsal Dale Station was situated on what became the Midland Railway’s (MR) main line between Ambergate and Manchester Central. 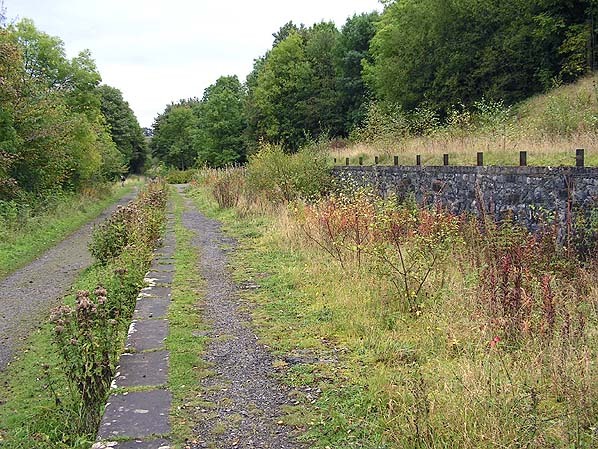 The line from Rowsley to Buxton, authorised in May 1860, opened in its entirety on the 1st of June 1863. Ever since the 1840s there had been a desire by the MR to reach the important industrial town of Manchester. Inter company rivalry, finance and landowner objections had all delayed things and it was only the possibility that rival companies might build a route between Derby and Manchester that finally moved the MR to get their Act of 1860. The line between Rowsley and Buxton was only the first stage though as on the 1st February 1867 a further line opened from Blackwell Mill to New Mills. This gave the MR a route stretching all the way to Manchester which it had long desired. Shortly after the line to Buxton opened it was agreed that a siding for mineral traffic be built at Cressbrook which, it is understood, was at the request of the owners of the nearby mill. This required the construction of an access road and at the end of 1864 it was recommended that a station should also be provided. Cressbrook Siding eventually opened on 1st May 1866. The passenger station, for which costs were kept to a minimum by reusing a temporary wooden structure from Evesham (a contract was let for its removal from Evesham and re-rection at Monsal Dale on 15 May 1866), due to its perceived limited usage, was opened on 1st September of the same year five months before the connection with Manchester was made. It was named Monsal Dale from the onset. Cressbrook Siding was also renamed Monsal Dale from the same date. The station was located to the south of the small settlement of Upperdale on the south side of the River Wye. Monsal Dale station was perched high on a hillside and was provided with two platforms. The northbound platform, situated on the south side of the line, was constructed of local stone in the conventional manner. However the southbound platform, on the north side of the line, could not be constructed conventionally as the ground fell away sharply. Therefore the southbound platform was constructed of wood and it was held up by stilts. Monsal Dale station was accessed via a bridge over the Wye and a lane that climbed up the hillside before passing under the line at the east end of the station. The lane connected into the northbound platform. The former Evesham station building located on the northbound platform at its eastern end. It housed the booking office and waiting room but WCs and urinals were not added until the Autumn of 1875. There were no facilities on the southbound platform, which must have been quite unpleasant for passengers during inclement weather. The platforms at Monsal Dale were very low and remained so throughout the station's life. Monsal Dale station was provided with goods facilities in the form of a single siding and a loading dock on the south side of the line at the west end of the station, the siding running behind the down platform. The siding and loading dock was originally for mineral traffic only but was used for general goods traffic from 1914.A signalbox was located on the north side of the line at the west end of the station which controlled traffic movements along the main line and into the siding. In 1923 Monsal Dale Station became part of the London Midland and Scottish Railway (LMS). Little changed, and things carried on as they had in MR days. The station was never very busy for the last year of Midland ownership in 1922 showed that just 4,223 passengers were booked and that expenses were £200 greater than income. The LMS obviously took the view at that time that Monsal Dale was more important as a destination for excursionists, and that revenue would be lost if the station was closed and the station became popular with Ramblers who used it to access the Peak District from the big cities and industrial towns of the North West and the East Midlands. In January 1948 Monsal Dale station became part of the nationalised British Railways (London Midland Region). Due to the station's low patronage it came as no surprise when it was closed to regular passenger services and to goods on the 10th August 1959. The station was used after that date by Ramblers specials until the 3rd April 1961. The line through Monsal Dale had remained as busy as ever during the 1950s and into the 60s. The line had been considered for electrification so it came as a surprise therefore when local stopping services between Matlock to Chinley and including Buxton was earmarked for closure in the 1963 Beeching Report. Through freight and parcels traffic was withdrawn on 3rd October 1966 and the remaining stations on the line closed on the 4th March 1967. The line was closed from Matlock to Peak Forest Junction. 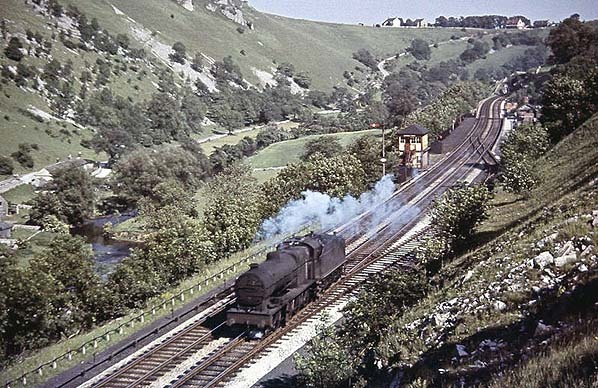 Express passenger and goods services continued to pass through Monsal Dale until the 14th July 1968 after which the line from Matlock to Peak Forest Junction closed completely. Track lifting began in 1969. Monsal Dale station's northbound platform has survived closure and can still be seen. Also a little to the east of the station a platelayers' hut is also in situ. In 1982 the Peak District National Park established the Monsal Trail, a long distance path that uses many miles of the former MR route including the section that passes through Monsal Dale station. Sources: Lost Railways of Derbyshire by Stan Yorke. Published by Geoffrey Kingscott & The Monsal Trail then and now by Alistair Lofthouse – Ald print. Additional source Glynn Waite. All tickets from Michael Stewart except 5443 Glynn Waite route map drawn by Alan Young. Click here for a more detailed history of the complete closure process of the Derby - Buxton/Manchester line. 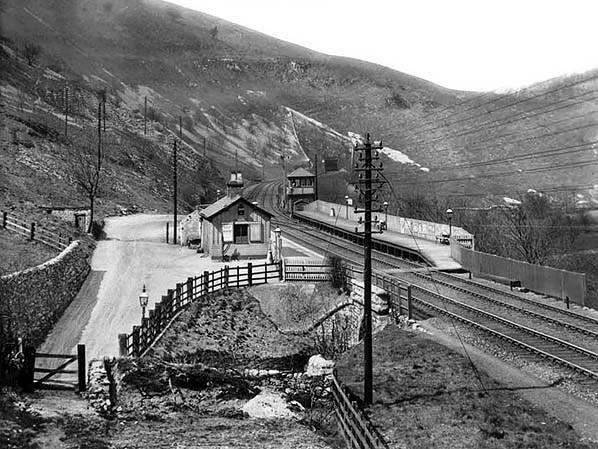 Monsal Dale station looking north-west in 1911. Monsal Dale station shown on a six-inch scale map from 1897. Monsal Dale station shown on a twenty-five-inch scale map from 1897. Monsal Dale station shown on a hand drawn plan (click here to see a large version). 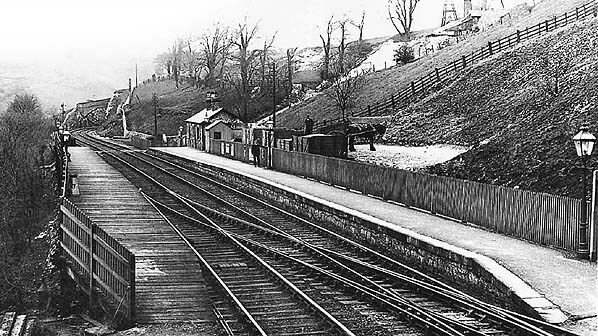 Monsal Dale station looking south-east in 1911. Looking northwest along the northbound platform at Monsal Dale in 1948. The station was provided with only basic passenger facilities. The platform on the right of the picture was of timber construction as it was perched high on an embankment. 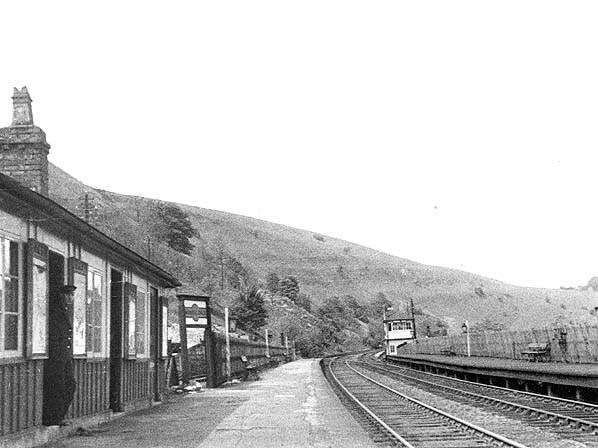 Looking towards the east at Monsal Dale Station in 1953. The picture gives a good overall view of the station and its facilities. On the right is the goods siding which ran behind the Manchester direction platform. At the end of the goods siding can be seen the station's simple single storey building. 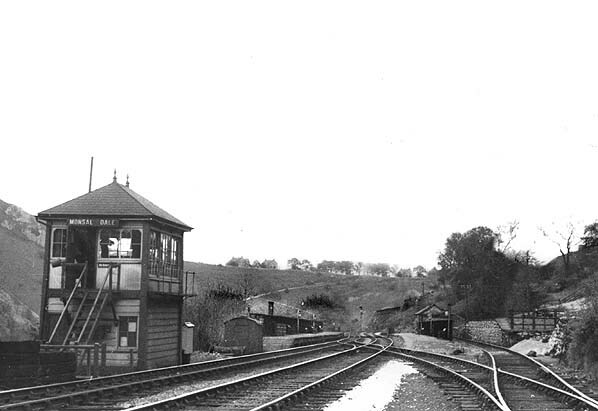 On the left of the picture is the Monsal Dale signalbox which controlled access to the goods siding and traffic movements along the main line. Beyond the signalbox is the Derby direction platform which was constructed from timber as it was perched on the side of an embankment. 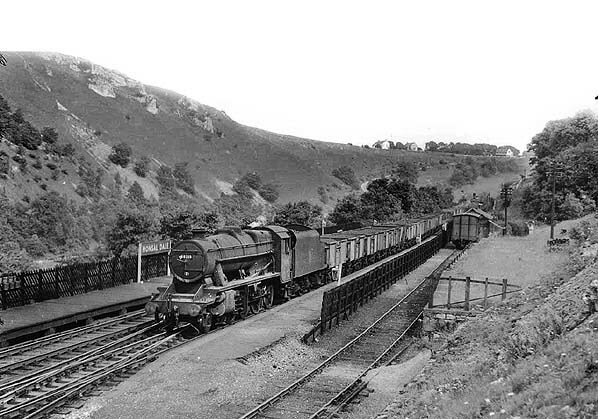 Down mineral train passing through Monsal Dale station on 19 July 1958, the single siding goods yard is clearly seen on the right.